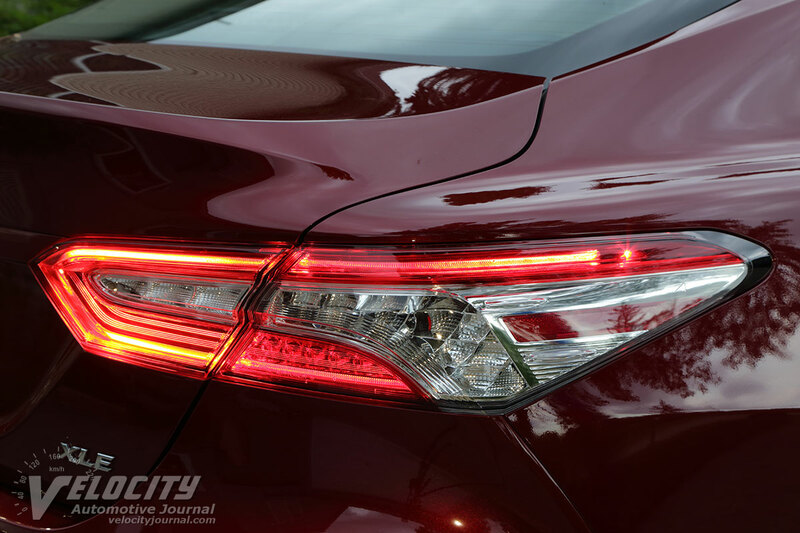 The Camry has been the preferred midsize sedan for millions of customers over two decades. 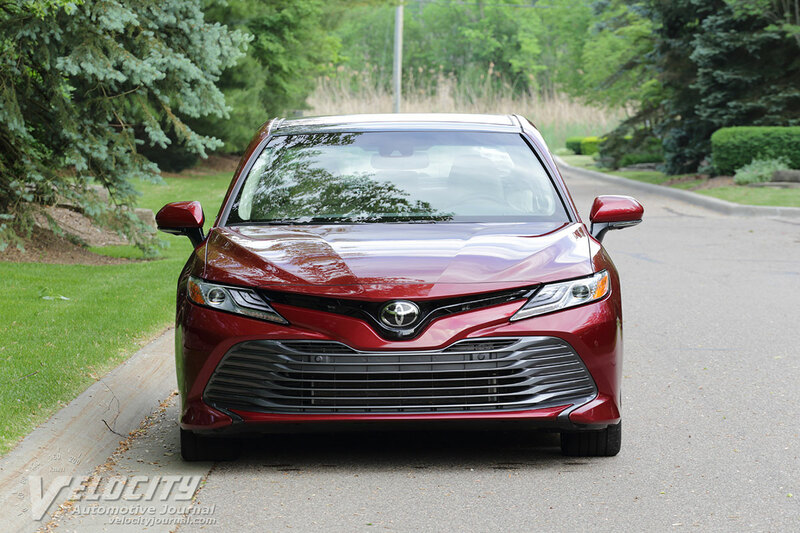 Yet as SUVs and pickups have grown to over half the market, Toyota needed to make the new Camry stand out from the crowd of competitors. Toyota has aimed to keep the Camry affordable, as the entry level Camry L starts at only $23,645. A total of seven gasoline-powered models, plus three hybrids ensures that every customer has a Camry priced within their budget. We tested a midlevel Camry XLE with an MSRP of $28,600. 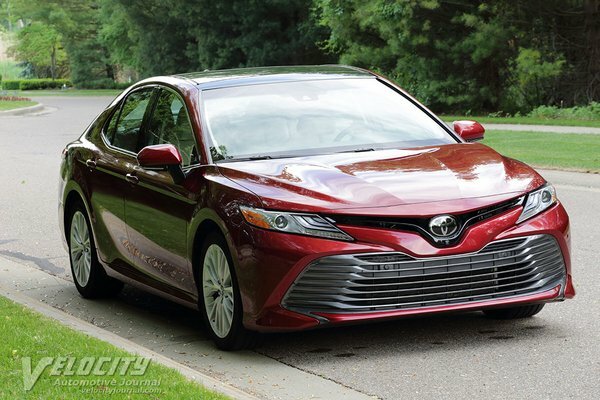 The sporty Camry XSE V6 is the most expensive model, starting at $35,100. 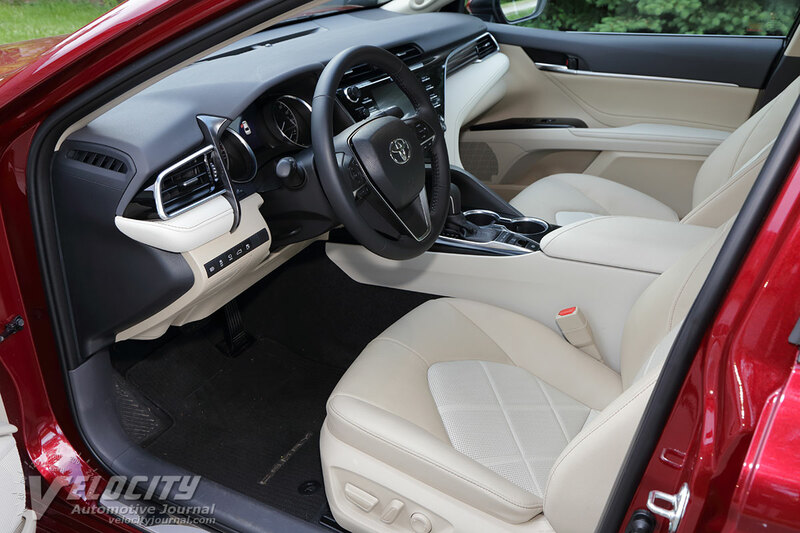 Notable standard equipment on the XSE includes LED headlights, alloy wheels, leather power seats (heated in front), panoramic moonroof, dynamic radar cruise control, lane departure alert, blind spot monitor, and rear cross traffic braking. 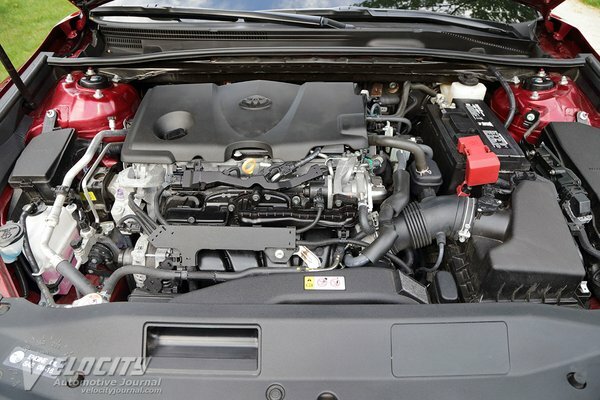 Although most other midsize sedans have added a turbo inline-4 into the engine lineup, Toyota retains its normally aspirated 2.5L four, complemented by an optional 301 hp 3.5L V6. The direct-injected inline-4 is rated at 203 hp @ 6,600 RPM and 184 lb.-ft. @ 5,000 RPM. In the XSE, the engine gains 3 hp and 2 lb.-ft. of torque. The all-alloy inline-4 is topped with twin-cam cylinder heads and variable valve-timing (VVT-iE and VVT-I). 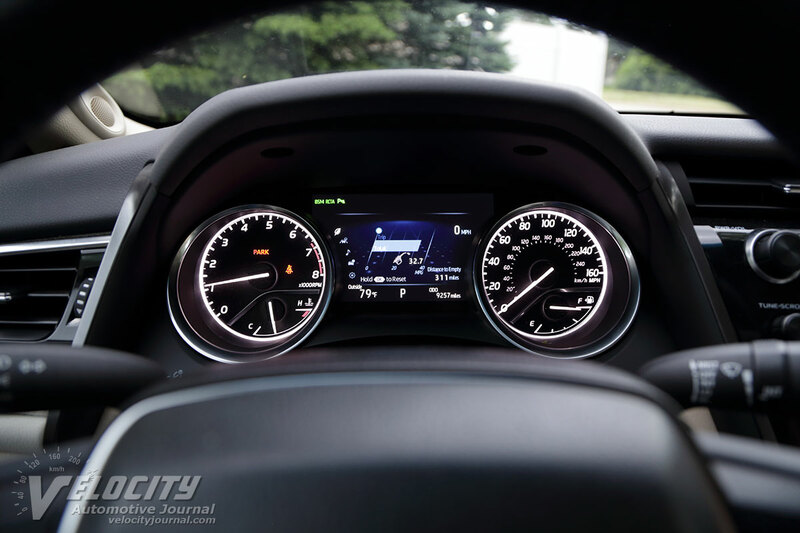 Fuel consumption ratings are 28/39 MPG city/hwy. Both the 2.5L and 3.5L engines are mated to an 8-speed automatic, although gear ratios for first through fifth differ between each engine. 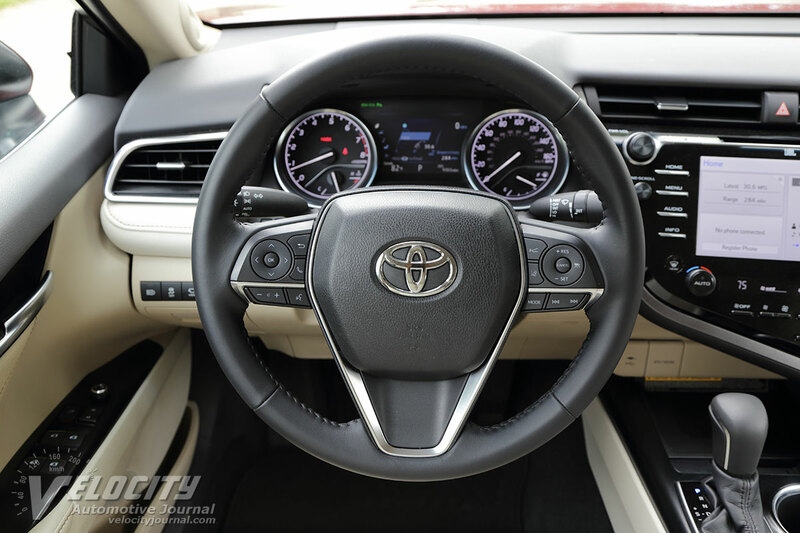 With two overdrive gears (0.808:1 and 0.673:1) and 2.802:1 final drive ratio, Toyota aimed to reduce fuel consumption. During mixed highway and urban driving, we averaged around 30 MPG. 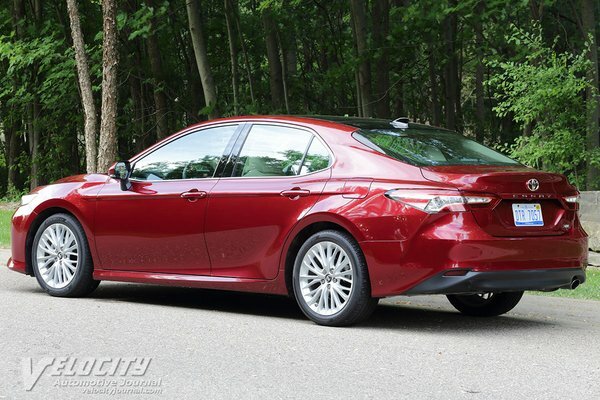 Toyota kept the typical front suspension layout of MacPherson struts and stabilizer bar (24.2 mm dia.) in front. At the rear is a double wishbone multilink setup with MacPherson struts, and stabilizer bar (25.0 mm dia.). 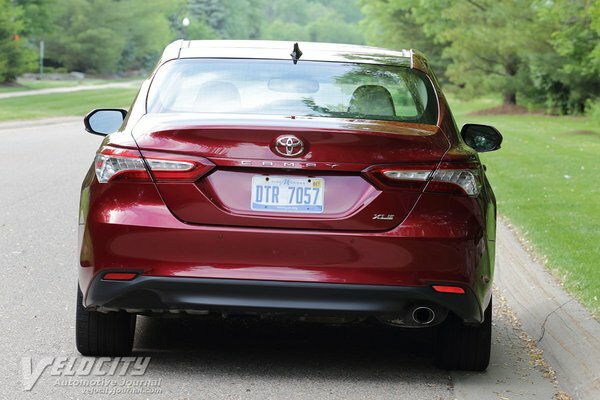 Camry SE and XSE models get larger diameter stabilizer tubular stabilizer bars (25.4 dia. front & rear). Steering is via an electrically-assisted rack-and-pinion system with 2.6 turns lock-to-lock. Brakes are all-disc with 12.0 in. dia. front rotors and 11.06 in. dia. rear rotors. 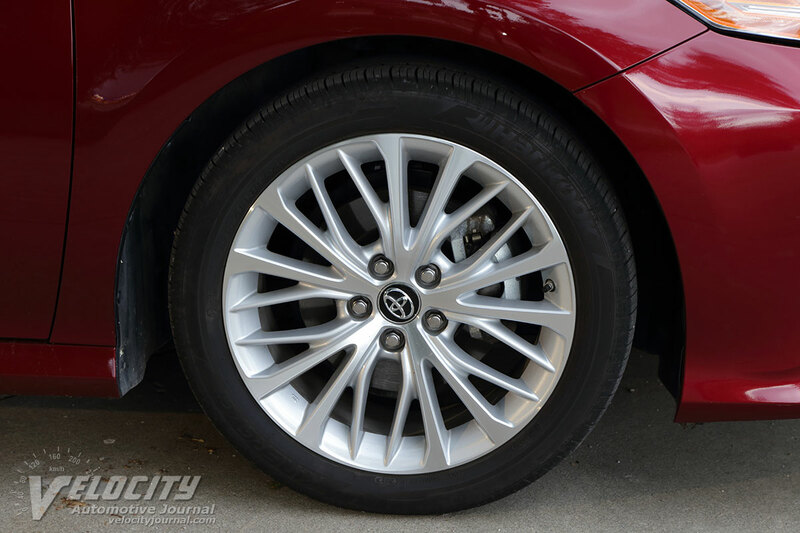 Camry XLE models are equipped with 18-inch diameter alloy wheels shod with P235/45R18 all-season tires. ABS, VSC (Vehicle Stability Control) and SST (Smart Stop Technology) are standard. Curb weight is relatively light at 3,351 lbs. Opting for the V6 raises curb weight to 3,549 lbs. 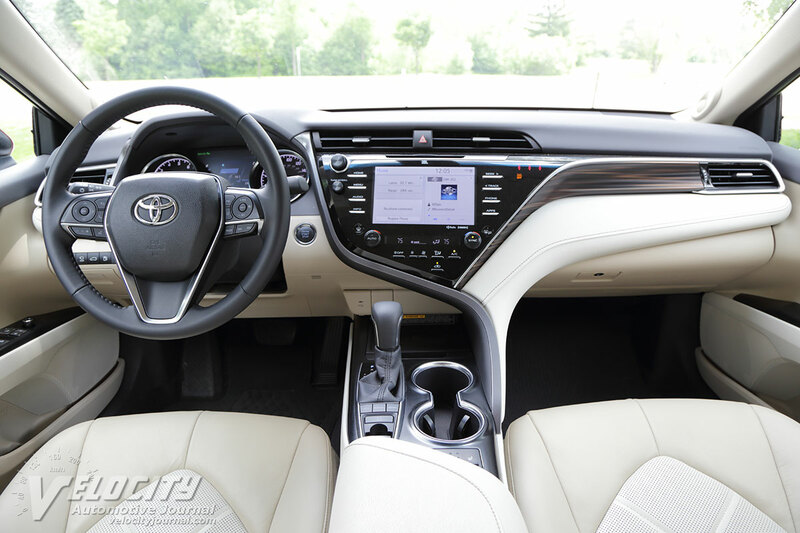 Toyota focused on the interior details for the new Camry, especially in the XLE model, which is full of luxury touches such as stitched door panels, perforated leather seats, and matte aluminum trim. 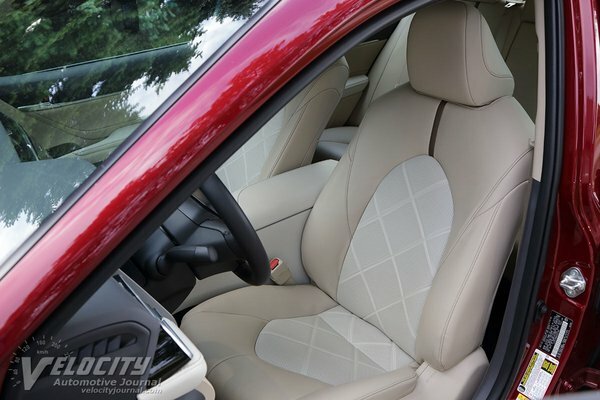 Most interior surfaces are padded, further the impression of luxury. 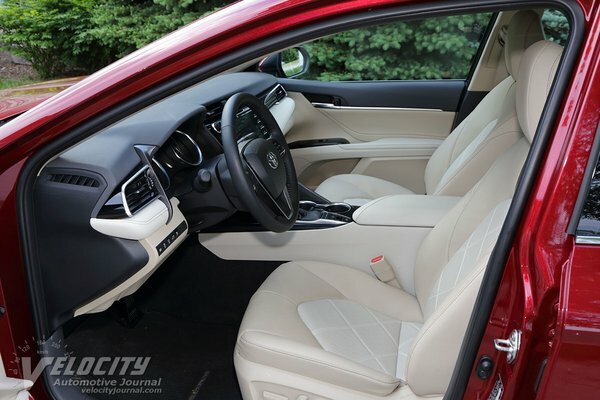 Soft leather seats pamper passengers with superb comfort and reasonable lateral support. Front seats heater controls are conveniently located on the center console. 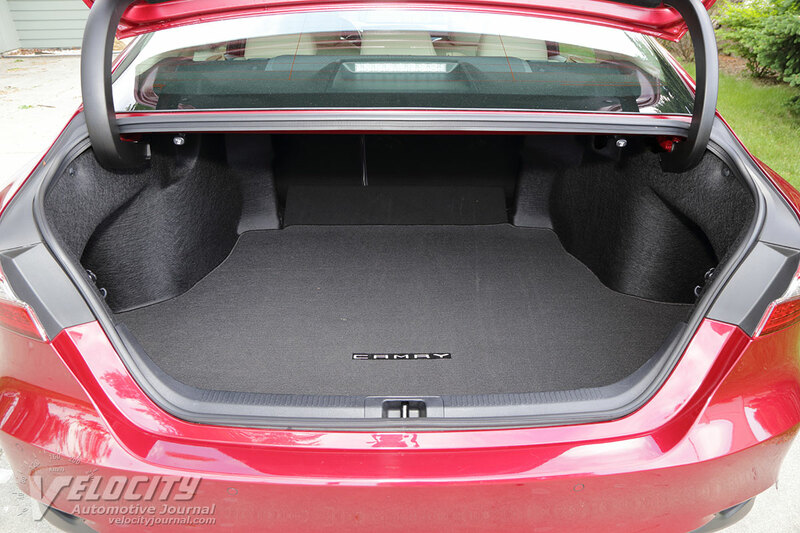 Headroom front and rear is adequate for occupants up to 6 ft. tall. 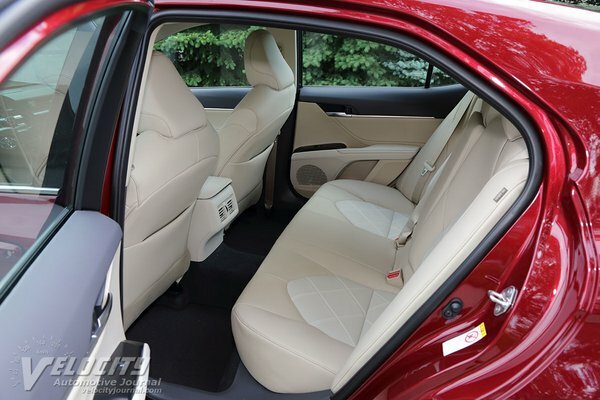 Rear legroom is generous, and so is overall seat comfort. The panoramic moonroof spans both front and rear seats. 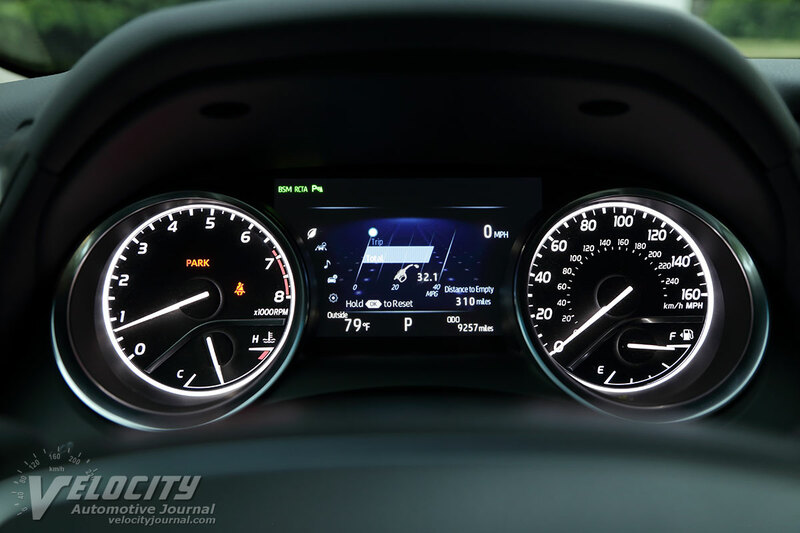 A conventional instrument cluster consists of backlit analog speedometer and tachometer, complemented with fuel and coolant temperature gauges. A multi-function LCD display show fuel consumption, digital speed readout, exterior temperature and other vehicle data. 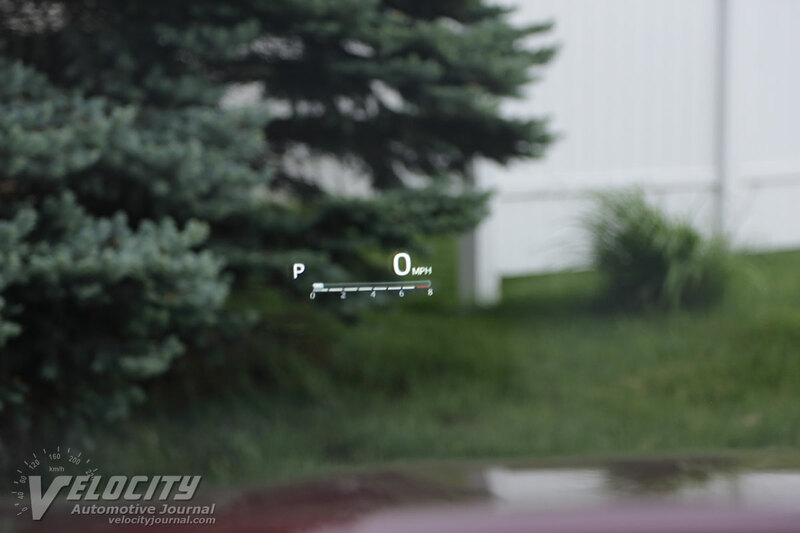 A head-up display projects vehicle speed and transmission mode on the windshield directly ahead of the driver. 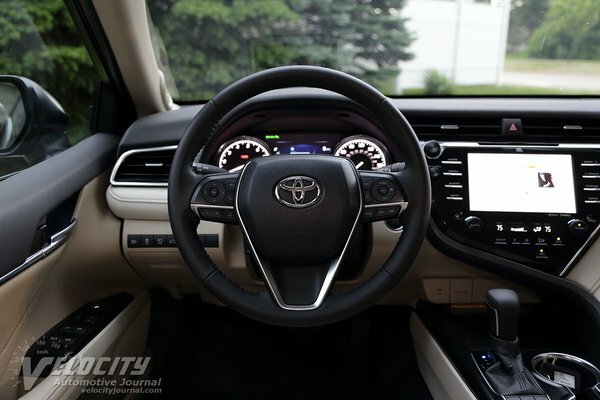 Integrated within the leather-wrapped steering wheel are phone, cruise control, and audio system controls. 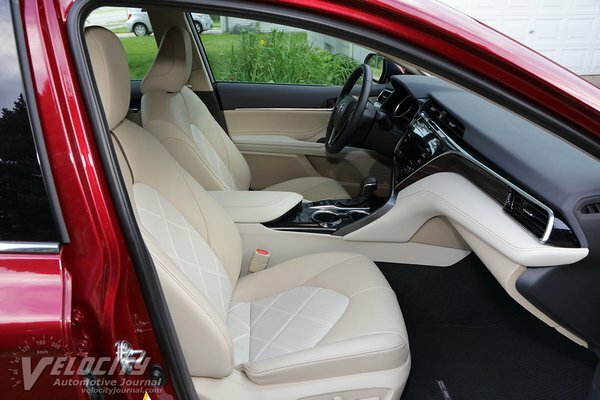 Opting for the XLE adds a larger 7-in. diagonal touchscreen, surrounded by slim buttons for frequently used functions, along with knobs for the JBL audio and HVAC system. 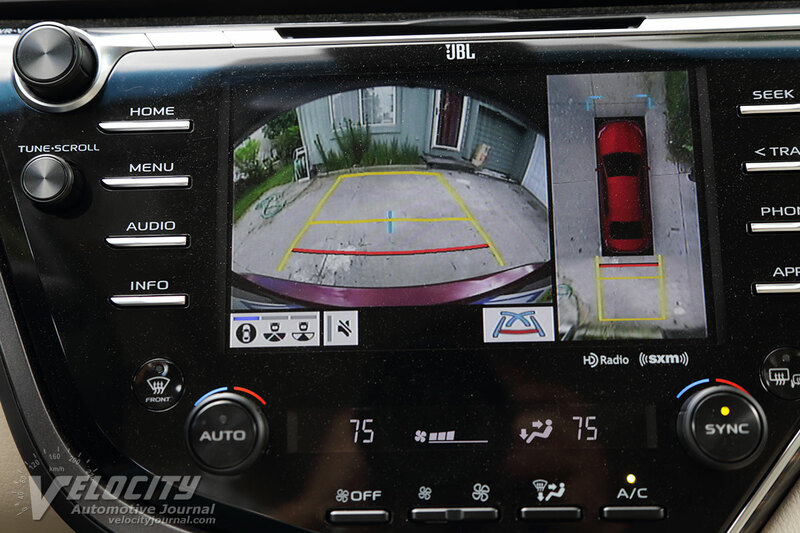 Besides the standard rearview camera display, other cameras project a 360 degree overhead view to aid parking maneuvers. 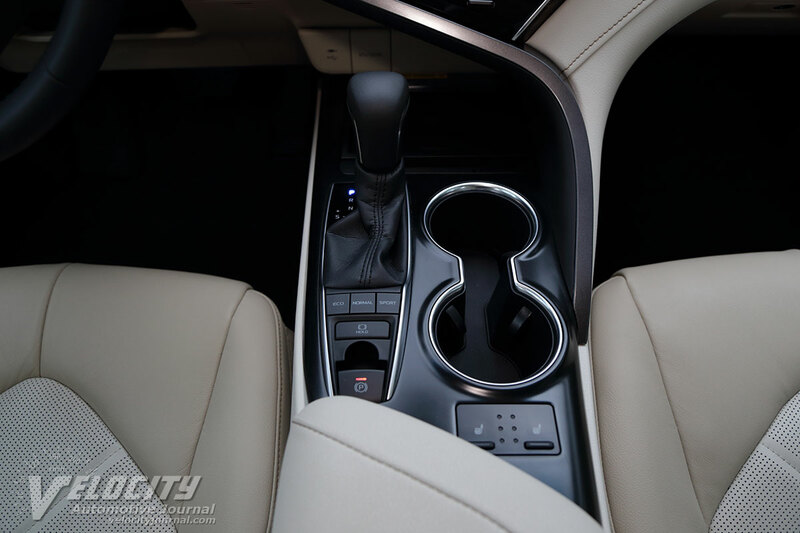 Dual cupholders on the center console are conveniently located next to the transmission shift lever. Complementing the USB and analog audio inputs on the center stack are additional 2 USB ports within the center console bin. 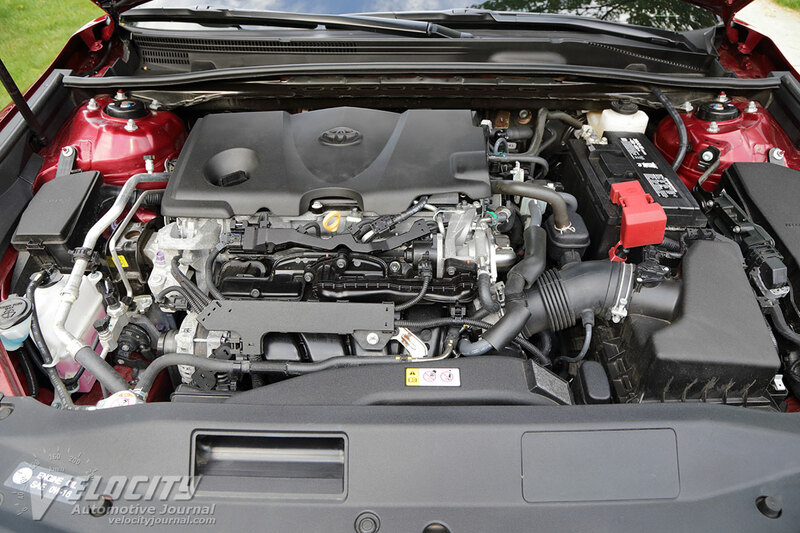 The new inline-4 endows the Camry with decent midrange and highway passing acceleration. Coupled with the 8-speed automatic that delivers seamless shifts, this powertrain delivers more than adequate performance. Only during full throttle acceleration is the engine noticeably audible, but never sounds coarse like most other large displacement fours. Since Toyota offers the sporty XSE trim, the XLE can continue its mission to be the luxury Camry. Unsurprisingly, suspension tuning is biased toward ride comfort, with soft springs and relaxed damping. However, the 18-inch diameter wheels and 45-series low profile tires fitted to the XLE cannot adequately isolate the cabin from potholes and patched road surfaces in southeast Michigan. Steering effort is lighter than we prefer, but the electrically-assisted rack-and-pinion system communicates road textures without excessive kickback. Braking performance is impressive, along with firm pedal feel. 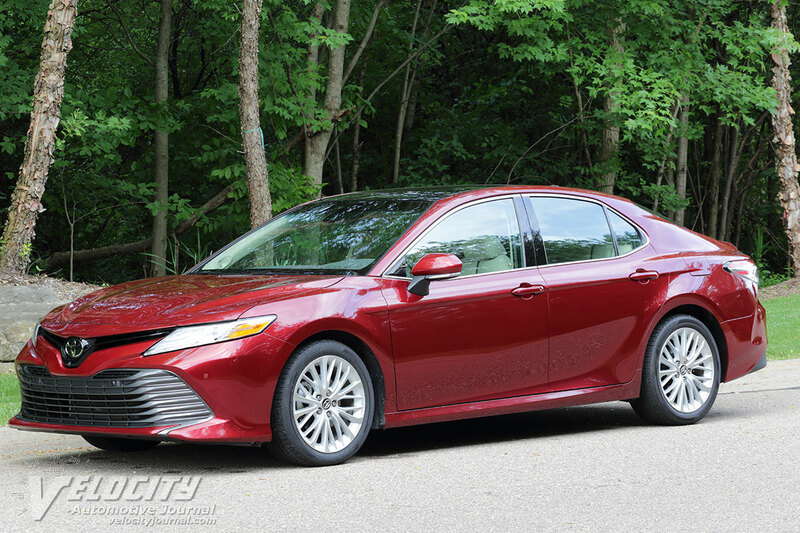 Moderate understeer and significant body roll confirm that the Camry XLE is aimed at customers who are looking for a long distance cruiser. Enthusiasts should head directly for the Camry XSE instead. The Camry is without question one of the best affordable midsize sedans in its class. 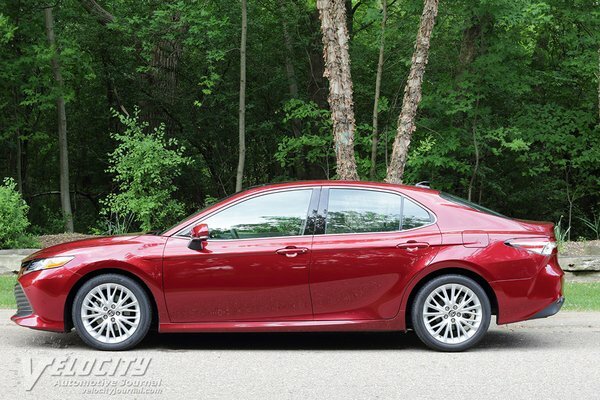 Toyota offers a variant for everyone, with competitive pricing throughout the model range. 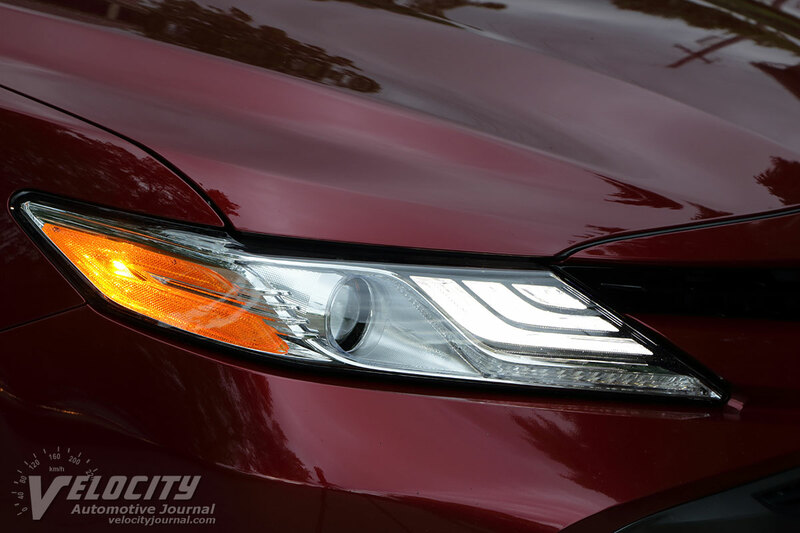 Despite declining sales in this segment, the Camry needs to remain relevant to battle the Accord, Malibu, and Altima. 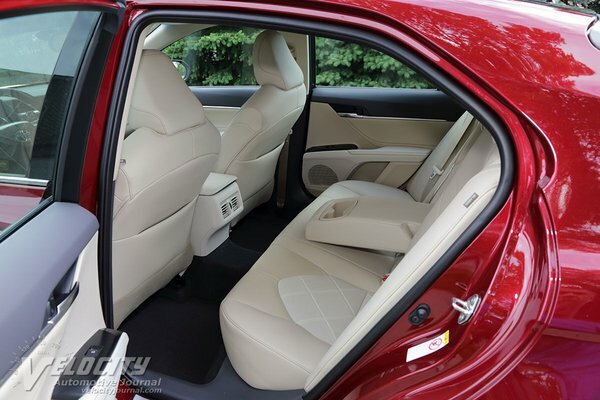 Current owners can rest assured that the new Camry is sure to please.